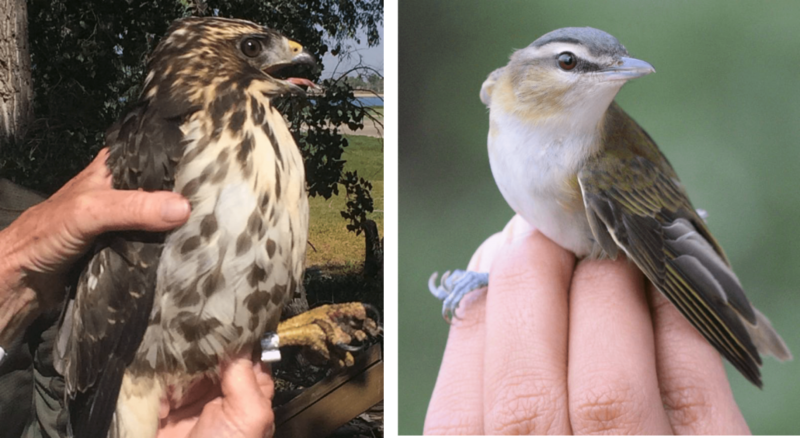 We had a very productive season at Bird Conservancy of the Rockies’ banding station at Barr Lake in 2018. 1,902 individual birds were caught last year – more than any year in over a decade! Many visitors to the station enjoyed the opportunity to see these birds up-close. Such experiences serve as inspiration points to nature, giving families, children and students a chance to see real science in action and meet and interact with bird biologists. In addition to educating visitors of all ages about the importance of birds in our lives, our stations also contribute to our understanding of bird distribution, population levels, and conservation needs at key migration stopover habitat. Banding stations are placed in sites where birds congregate in large numbers during migration. These stopovers generally have excellent habitat that offers food and a safe place to rest. Scientists set up a series of mist nets to harmlessly trap birds. When a bird is removed from the net, its leg is fitted with a small metal band, and the bird is weighed and measured to evaluate its condition. Each band has a unique number on it so that if the bird is recaptured or found later, scientists will know when and where it was banded. Barr Lake State Park, located along the Central Flyway, is a vital rest-and-refuel location for avian travelers. 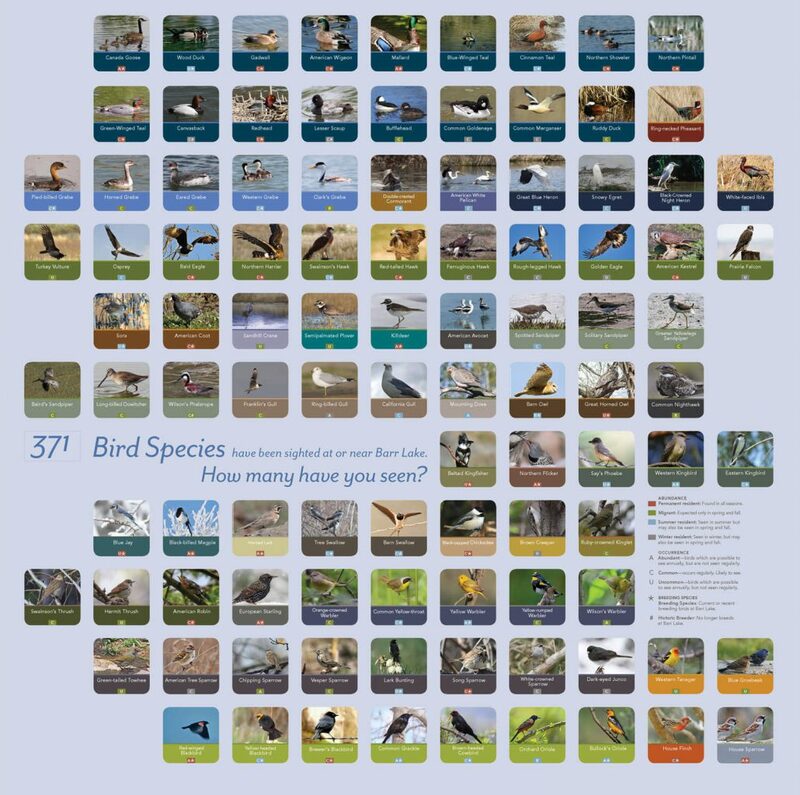 This poster in Barr Lake Nature Center demonstrates the amazing diversity of birds that have been documented in the park. Why was 2018 was such a good year for banding at Barr Lake? As scientists, we want to understand why some years see greater numbers and variety of birds. How do these trends inform the wider bird conservation landscape? For example, in 2018 almost every species did well, but some did far better than others. Wilson’s Warblers, almost always our most frequently caught species, again led the parade. We caught 626, which is more than any year in the last decade but not by much. However, Orange-crowned and Yellow-rumped Warblers—at 213 and 232 respectively—were off the charts compared to normal years. These three species (out of 61 total) accounted for over half of the birds we caught. This lucky group of second graders got a great look at a Sharp-shinned Hawk. 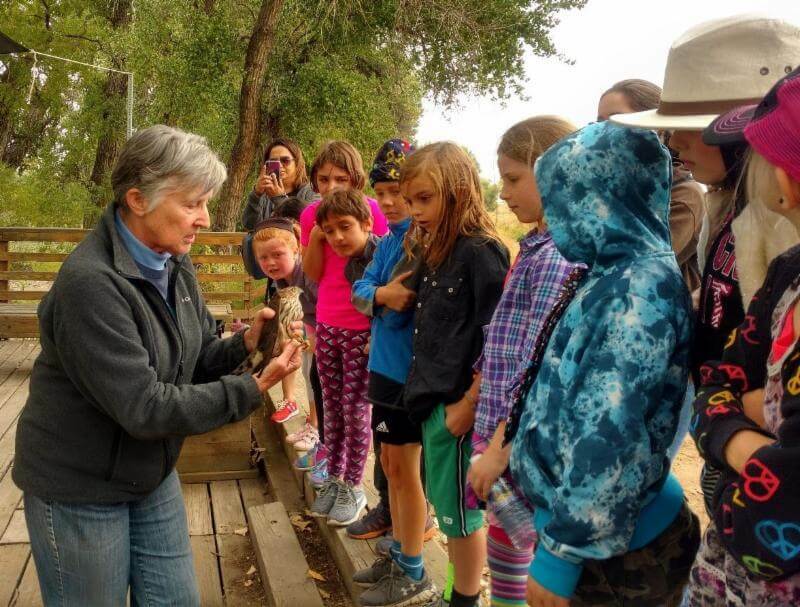 Last year 1,079 students learned firsthand why birds are important when they visited the Barr Lake banding station. Thanks to generous supporters who help fund scholarships for Bird Conservancy education and banding programs, 521 underserved students were able to participate in our banding station. Many visitors noticed that we collected a couple of tail feathers from warblers. By analyzing the hydrogen isotopes in the feathers, we hope to gain a better idea about where the birds that migrate through Barr Lake in the fall hatch or breed. This is an example of students seeing the scientific process in action, and having opportunities to engage with and ask questions. It’s a particularly special and unique experience for students from urban areas. As we share our work and what we hope to learn, we help them see—with both their heart and their head—why birds are important and relevant. To everyone that visited the station last year, we thank you! We enjoy being able to share the wonder of these birds with you and hope you enjoyed your visit. If you haven’t yet experienced one of our bird banding stations, please do! Check out our banding page which includes a full list of the spring and fall stations we operate, along with dates and hours of operation. Chip in to support bird banding! You can help ensure Bird Conservancy’s banding stations continue to engage students of all ages and backgrounds and useful information to advance bird conservation science. Be a part of helping us deliver another successful banding season in 2019 and beyond!